I’m starting on a project to add WiFi Controlled LED perimeter strip lights to a bedroom. I thought I’d capture this project in a series of posts, starting first with the decisions around what to use for this project. 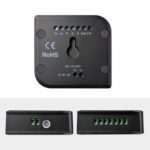 Whilst Philips Hue is probably best known brand for smart lighting, they are also quite expensive (a 2m strip and power supply costing over £47 at time of writing). 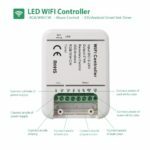 So to do this more affordably I looked for alternative WiFi LED solutions and ones that I could control via my existing home automation system Home-Assistant.io that I’ve spoken about in a previous post. The initial plan was to install a strip along a single wall to provide a colour wash effect on a given wall. However, after moving the furniture around to the layout shown above it was thought that having multiple different areas which could be given different lighting themes would be a good ideas. Adding an extra zone shouldn’t be too complicated or expensive. Once we started discussing an extra zone, one zone quickly became four. Of course the zones can be grouped in any combination, so provides flexibility for being able to easily create consistent colour washes on all the walls, to having the bedroom zone automatically come on and slowly get brighter in the morning. There are many varieties of LED strip light, though the most common colour strips use 5050 SMD LED Chips (5mm x 5mm Surface Mount Device LED), RGB strips can create a wide range of colours and create a near white by driving the red, green and blue LEDs at full brightness. 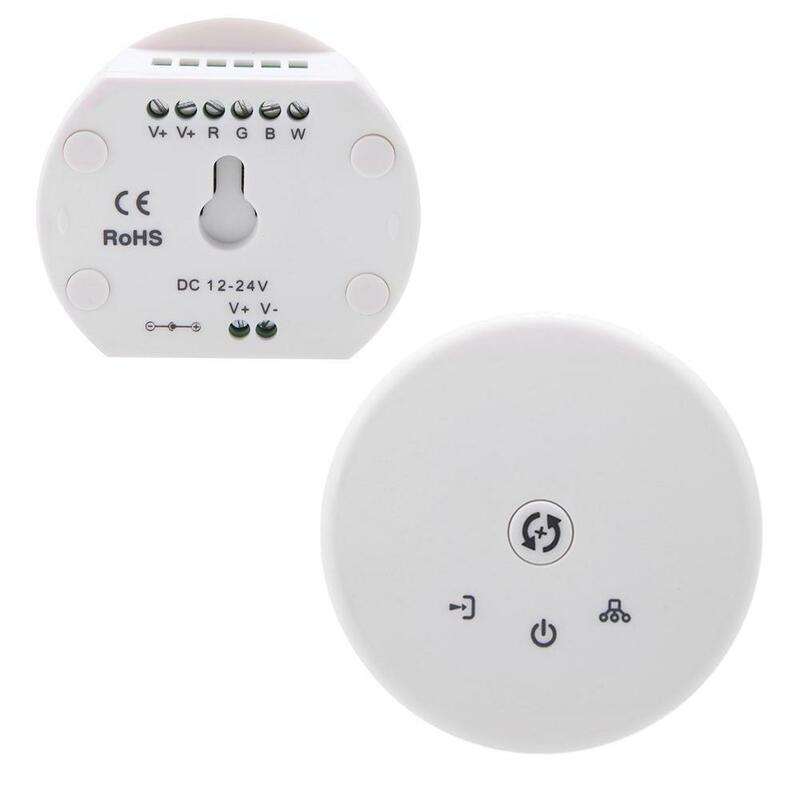 RGB+W comes in two main forms, a 4-in-1 LED chip that as the name suggests includes a red, green, blue and white LED, the other strip type has a standard 3-in-1 RGB alternating with a white LED. The addition of the white in either case allows for a purer white tone to be created, along with mixing it with RGB to create more colour combinations, specifically less vivid and more pastel colours. The White LED can be a cool (RGBW) or warm white (RGBWW) type depending on preference. The RGB+W LED strips are more expensive than RGB versions, but not significantly so if you are willing to shop around. The density of LED chips per metre is another variable which will impact how the even the distribution of light is from the strip. Typical densities are 30 LEDs/m, 60 LEDs/m and 120 LEDs/m, for each configuration 3 LED chips would take 100mm, 50mm, and 25mm of the strip. Whilst 120/m might seem appealing the power requirements for large areas of this configuration quickly ramp up. LED Strip will be supplied typically in 3 forms based on different levels of Ingress Protection (IP rating). IP20 are bare strips (as seen in the first of the strips with the 4-in-1 chip), IP65 are sealed over with a clear epoxy coating and IP67 in a sealed silicon tube (like the second strip in with the separate white LEDs). Bare strips are significantly cheaper and ideal if you plan to enclose the LEDs later. The final variation in LED strips is the voltage they need. 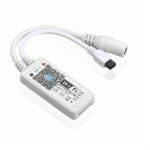 You’ll find some short strips that are often USB powered which run on 5V, however these tend to be only suited to short lengths < 2m. 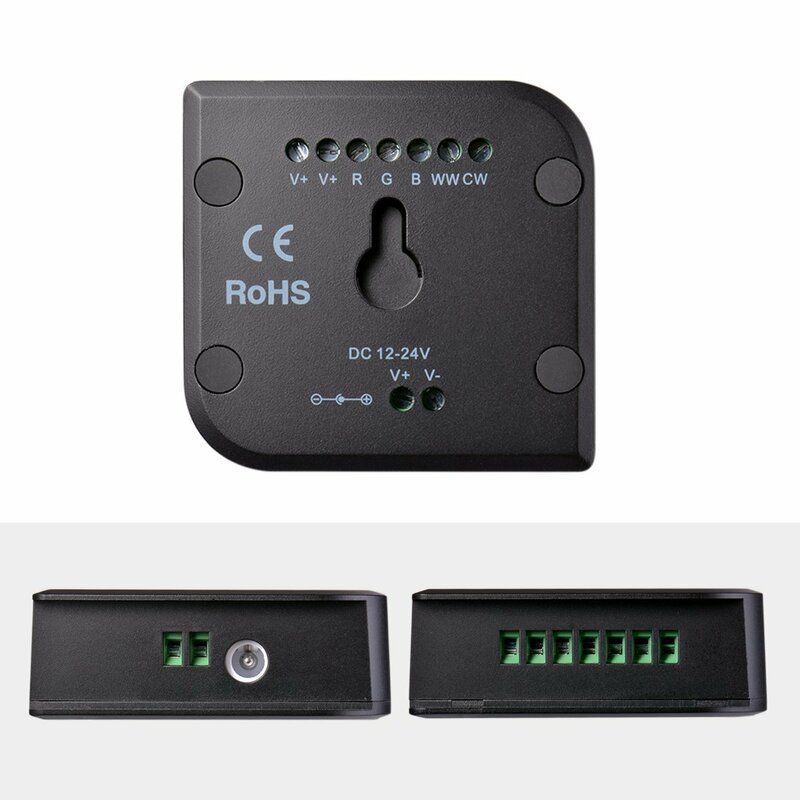 The most common LED strip will be 12V which are suitable for runs of up to 5m, longer and the voltage drop means inserting signal repeaters or extra voltage taps. You will also find 24V strips which typically support strip lengths up to 10m. So what strips did I decide on? On eBay I found a seller offering RGB+W 4-in-1 chip strips in bare IP20 form, and I selected to go for 24V, at the time not having decided how I was going to zone things. The 20m I ordered was less than £27, remember a 2m Philips Hue strip is nearly fifty pounds. Whilst installing a drop ceiling to hide the LEDs would probably be more attractive, or to hide them along the bottom edge of some coving could be another option. I wanted a simpler/cheaper solution, aluminium profile seems the most practical choice, with an opaque diffuser to help soft the bright spots from the LED and also hide the components mounted to the LED tape. Having selected RGBW strips, this means they have 5 connections, which means the strips tend to be wider than RGB or simple white LED strips. So finding profile which would support 12mm wide strips took a bit of hunting, especially as many profiles list there external dimensions not the internal ones, very frustrating! 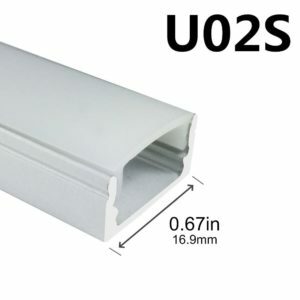 I finally settled on 9x17m Aluminium Channel Profile, which has an internal dimension of 12.14mm and a small bead within the profile to hold the tape. Being just 9mm high the diffuser will soften each LED, but not completely remove the spot effect, to do so would require taller strips which would make the profile to prominent on the ceiling. (Update 5 Feb 2018) You can see more about the diffuser and its effect in Part 2a of this series. Be careful when selecting controllers to ensure that they are RGBW not just RGB if using RGBW strips. 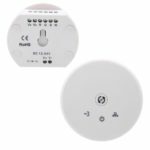 Also Sunix do a “UFO” in two forms, a bluetooth version and a WiFi version, so select carefully. I’m currently experimenting with each controller before deciding on which one I’ll use. 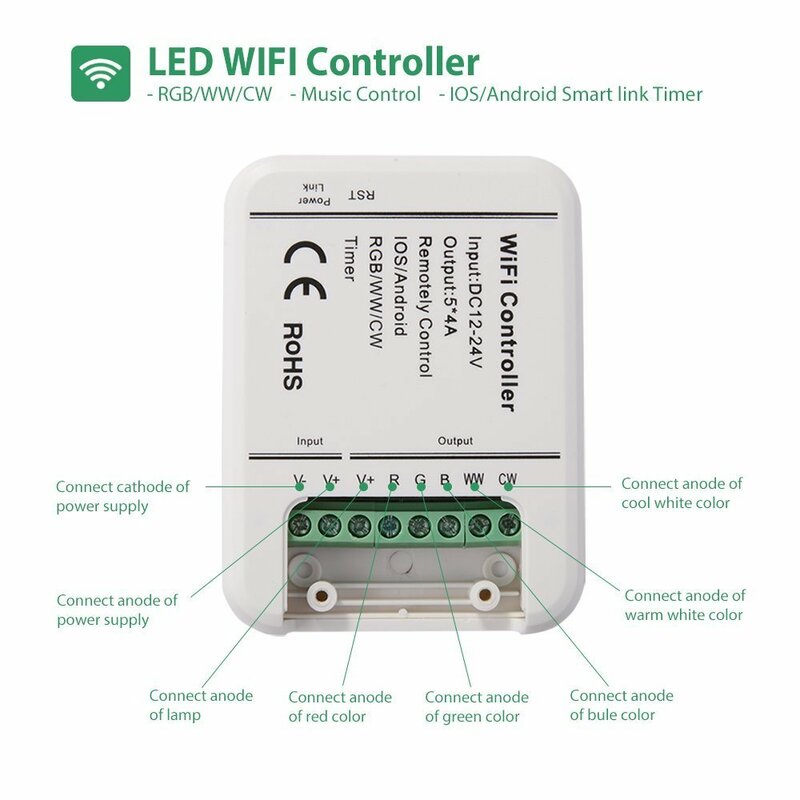 (Update 5 Feb 2018) Part 2b of this series of posts covers more the selection process for the WiFi LED Controller. 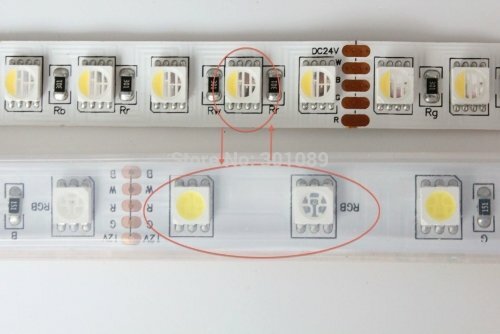 The sellers of LED strips don’t always provide all the necessary information to know the power requirements. However a little bit of research indicates the 60 LEDs/m RGBW (24V, 4-in-1 chip) type are 14.4W/m. So 5m would require 72W, which at 24 Volts would be 3 Amps, with a recommendation to allow 10% headroom on PSU power, so 3.3A per 5m. 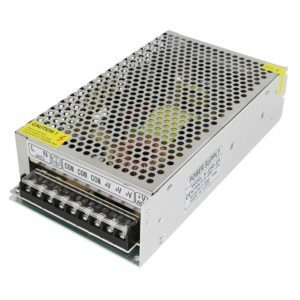 This could be delivered via a multiple power supplies for each 5m segment, or though a single higher rated PSU. The choice of power supplies turned out to be more problematic than I thought. One of my purchases to get the Sienoc Mini also included an LED strip and a 24V 3A PSU, from a UK ebay seller. 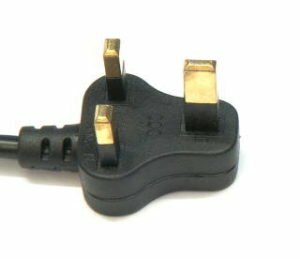 This was supplied with an un-fused UK plug (which also has plastic protection on the earth pin), which is rather scary, and though could easily be replaced with a fused plug it started me thinking. The power supplies are going to be installed in the loft, where I’m not going to see them or feel them to see if they are getting warm. I certainly want them to be safe and not a potential fire risk. 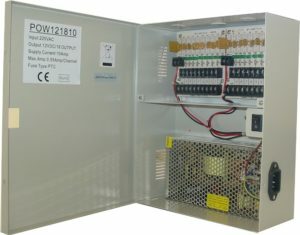 However, such power supply enclosures (mostly commonly used for CCTV) are typically 12V and also start to get expensive, even when looking for the metal enclosure alone. I then started to look at some other enclosed power supplies intended specifically for driving LEDs. 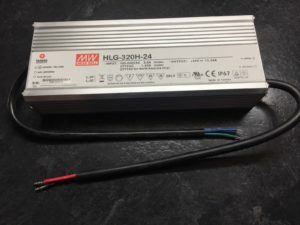 Again I initially found these expensive, until I found a deal on ebay, where I managed to get a Mean Well HLG-320H-24A LED PSU for less than £40. This is a 24V 13.3A PSU IP67/65 power supply, that I feel is more suited to an un-monitored environment like my loft. The 13.3A rating is more than enough for the 15-16m of LEDs I plan to drive from it. 5 conductor cable, to connect strips to strips, around corners and also strip to controllers. As this needs to pass through the aluminium and the ceiling, it may not be ideal and instead I’ll look to source some 5 core round cable. 5 pin 90° Angle Connectors, for connected strips around corners, but not sure the connector will fit within the aluminium, will need to check when it arrives. 2 conductor black/red cable, to connect WiFi LED controllers back to the Power Supply. I purchased the 10A, 32 strands x 0.2mm cable.